When we are camping, lifting a 5 gallon (25 litre) water carrier is a lot of effort every time you need some water. So many years back, I built the first prototype of a portable water pump. 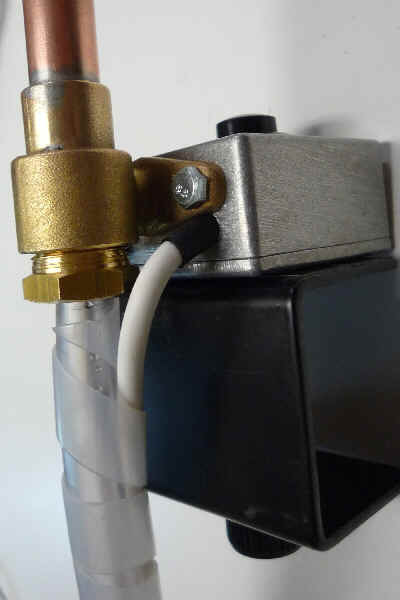 This uses a standard 12V “caravan” pump, available from most camping shops or online stores like Towsure. It would normally be clipped to a table with the pump itself inside a 5 gallon Aquaroll water carrier (or similar). Operation is simple; push the black button on the die-cast box, and water comes out (pretty quickly). The water stays in the single length of plastic tubing so it is all reasonably hygienic. The pump takes between 2.5A and 3A, but as it’s not running that often, battery usage is minimal. Whale 881 or similar, though cheaper pumps are available. This is a standard electrical product, I used 15mm wrap, order code CBBR0911 from CPC though note that this is a 10m length! This was found in my junk box. I’ve not found anything similar on sale these days, though order code ST01298 from CPC will work. The biggest problem I’ve had with this is finding a suitably reliable switch. In the end, I used a “Horn Button”, order code CP03043 from CPC – so far, this has lasted well, and is big & solid enough to survive outdoor use. This is a length of thin 10mm wide aluminium that I found in my junk box. In the photo shown, this is 5A mains cable. The second model uses 13A “figure-of-eight” cable, which is probably more appropriate. The pipe is fixed to the pipe support using electrical tape. I tried heat-shrink tubing but it didn’t like the sharp bends. The various bits are just bolted to the die-cast box, and rubber grommets are used for the cable entry points. I sealed the box with some clear bathroom sealant – this should help with long term corrosion. 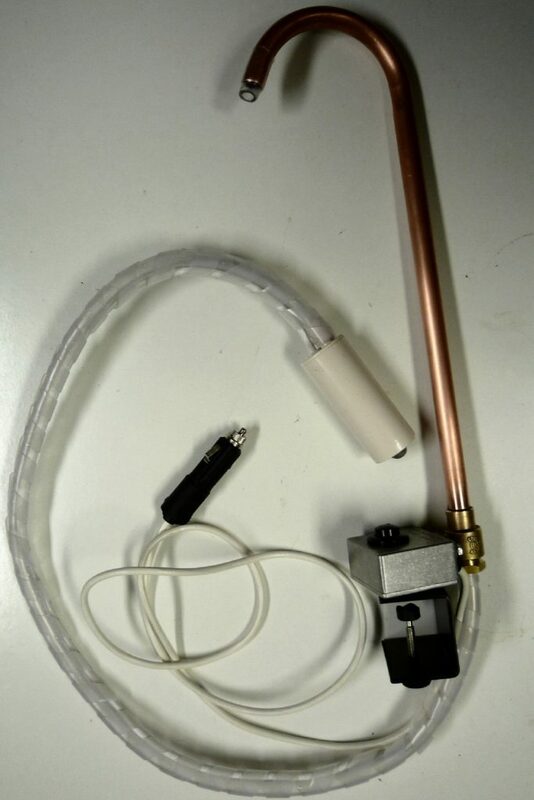 This version uses standard 15mm copper pipe (sleeved with the plastic pipe), soldered to a wall connector. This provides a much better mounting, at the expense of some flexibility in the water delivery. The pump is magnetically attached to the table clamp, allowing it to be easily lifted off to fill tall items. Whale GP1002 or similar, though not this model doesn’t have a filter on it. There are many sellers of this on Ebay. 1.5m of 10mm (internal diameter) clear tubing. 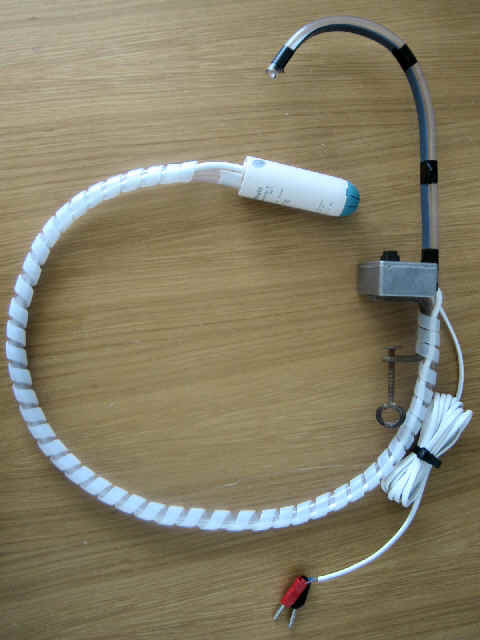 This is a “Microphone Clamp”, order code ST01298 from CPC. The connecting thread for the microphone needs to be sawn off. I put a strong magnet from an old hard disk drive in the die cast box; this holds the switch to the clamp, still allowing the pump to be moved to fill large containers. Alternatively, the die cast box can be bolted to the clamp. This is a length of 15mm copper pipe soldered to a brass 15mm “Wall Connector”, order code 6047 from BES, though most plumbing shops will have something similar. Note that the plastic pipe is a tight fit in the copper pipe around the bend. Either put it in first (though that will make the pipe impossible to solder to the connector), or use appropriate lubricant. This is 5A round two core mains cable connected to a 12V “Cigar” plug. Total cost in 2016 was around £35.